Pat Little “pays it forward” by donating an extra HEPA air filter to someone in need. Summers in Missoula start out colorful: green hillsides thick with yellow balsamroot blooms, lavender lilacs in town and deep blue skies. And before we know it, it’s August and the colors shift to orange suns and red flag warnings. The haze from western wildfires obscures the colors we love, and for many, dread creeps in. August in western Montana is now synonymous with wildfire smoke and hot temperatures. As our climate changes, we’re experiencing longer, hotter, drier summers and wildfire season stretches further into the fall. Although this past July was the second driest on record for these parts (just beating out 2017), so far this summer we’ve been buffered from the truly extreme heat and wildly behaving fires that other corners of the world are experiencing. A glance at the news and it’s “fire tornadoes,” melting pavements, people and animals fleeing. This is what climate change looks like. Climate Smart Missoula is a local organization working to address climate and energy issues. Our primary goal is to help reduce the pollution that causes global warming, but we also understand that we must adapt to the changes that have already begun. When we launched this effort back in 2015, we recognized that Missoula was under-prepared for dealing with changing summer conditions. No, we cannot install huge fans to blow the smoke out, pass out air-conditioners to all or escape with months-long vacations, but we can better understand the impacts and do more to stay healthy and resilient — to “weather the weather” of a warming Montana and consider ways to help the most vulnerable in our community. We began collaborative preparedness efforts with a program called Summer Smart, and last summer these paid off. Working with air quality specialist Sarah Coefield from the Missoula City-County Health Department, we developed a plethora of resources, including snazzy animated videos and a robust website. With seed funding from St. Patrick Hospital and in concert with Missoula Aging Services, we developed a pilot program to give away HEPA air filters to home-bound, low-income seniors with health issues. When the wildfire smoke rolled in, these individuals had clean indoor air and all reported back how incredibly helpful this was to their well-being. We provided filters to families with small children and, with generous community support, grew the program to help public schools improve indoor air quality. Working with the Health Department again this summer, we’re growing our HEPA filter program to assist more of our most vulnerable community members in times of smoky air: babies and small children whose lungs are still developing. Day cares and summer preschools are at the top of our list for assistance, and we’re working now to distribute filters and educate caregivers. We’re also accepting donations to help us buy more filters that we can then donate to those most in need. We’ve got lots more on our Summer Smart website including tips to stay cool and survive the heat (hint: add shades to the outside of your windows, plant and water trees, run fans, and, if you have one, shade you’re A/C unit so it runs more efficiently). And if you have friends in other parts of the state that would benefit from this information, you are in luck. We’ve been working to develop a Montana-wide one-stop shop for the lowdown on wildfire smoke: MontanaWildfireSmoke.org. Please share widely! Although we can continue to become more prepared for challenging late summer conditions, we also know we cannot “adapt” our way out of climate change. We must work collectively and take action to reduce our carbon footprint, use energy is smarter ways and develop new cleaner sources of energy. We need our elected officials to step up and lead. Let’s hope that our wildfire season gives us a break this year. As we say at Climate Smart, don’t forget to check in on your friends, neighbors and pets, and remember, the smoke will clear and the skies will be blue again, soon. Amy Cilimburg is the executive director of Climate Smart Missoula. 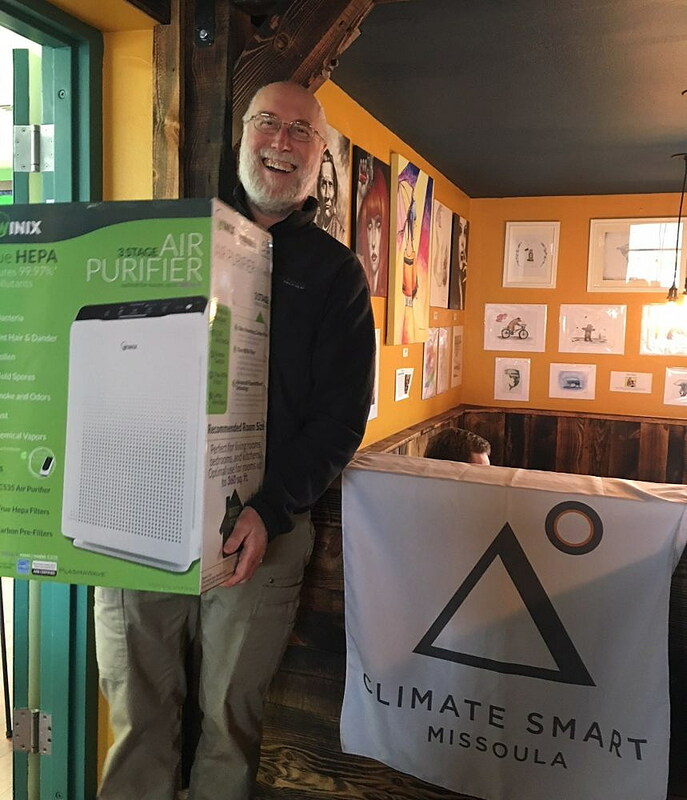 You can donate to their Summer Smart HEPA filter program here: https://www.missoulaclimate.org/donate.html. August 7: Float for the Fork: Float & River Cleanup. Join Western Cider & Clark Fork Coalition to clean the urban stretch of the Clark Fork River. Volunteers can then relax with a cold cider and yummy food from local food trucks. 5:00-8:00 p.m.
August 10: Missoula Environmental Art Expo: Insects and Art on the Clark Fork. Join the Montana Conservation Voters and the Watershed Education Network to inspect insects, make art, and discuss conservation and sustainability in the Clark Fork Natural Area near the Orange Street Bridge. 4 – 7pm. August 11: Montana Renewable Energy Association’s Clean Energy Fair, Gallatin County Fairgrounds, Bozeman. 9 a.m. – 4 p.m.